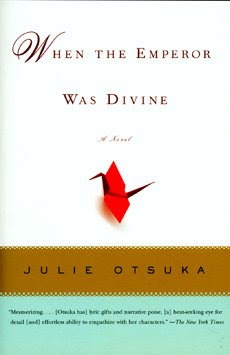 "Saying Goodbye to the Emperor"
The perspective of the young boy in Julie Otsuka’s novel, When The Emperor Was Divine, is a defining lens through which the reader can understand and experience this powerfully emotional narrative. His is one of five points of view that serve as chapters in this somewhat minimalist book about one Japanese family’s experience in an internment camp during World War II. The boy’s story is the central chapter from which the novel takes its name and recounts the loss of innocence that often accompanies difficult experiences or life transitions. In this story of struggle and survival, the boy is saying goodbye to his childhood, even his heritage, yet without an assurance that something better is waiting for him once the journey ends. In the absence of his protective provider, the realities of his situation eventually dawn on him. He realizes how little they have left. Their family is stripped of everything but the bare essentials, which include “three iron cots and a potbellied stove.” (50) Not only does he lose his possessions, his mother instructs him to “never say the Emperor’s name out loud.” (52) Refusing to lose all sense of identity, the boy sometimes whispers it anyway. Life in the internment camp eventually settles into a workable, if not enjoyable, routine to which the boy adjusts. There was school. There was the pledge of allegiance. There were the reciting of lessons and the playing of games. There was also news about the war. The months pass. The boy could almost believe he was living something close to a normal life. Despite the various struggles, the boy never gave up hope of seeing his father again. He imagined the day they would be reunited: “He’d rest his head on his father’s shoulder and smell the dust and the sweat and the faint smell of Burma Shave and everything would be very nice.” (105) This vision helped him survive and gave him strength to face the many painful days in the camp. After the war, the boy is indeed reunited with his father. However, life will never be the same. His father returns broken, and so does the boy to a lesser degree. He is no longer a child. During the internment he not only says goodbye to his childhood, but loses the innocent trust that a child has in governing powers. He’ll adjust, though – he did in the camp. Yet the scars will remain as memories.